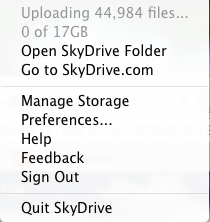 I’m sync’ing my iPhoto folders to Skydrive. It’ll take a long time as you can see how big the folder is. Next would be iTunes Match for all my music in the MBP. My friend said I ran along a thin line, it’s like catwalk. My feet and legs hit each other while I run. Now I’m pretty sure how it happened. Further rolled over lying on the ground facing sky. Assuming my cadence was 85 per minute then each step should have taken about 0.35 second. My left foot refused to go forward in this 0.35 seconds and this may also explain why my hands didn’t response quick enough to land with my palms. I now have to focus on my run posture such that my feet stay away from each other. If you run prepare to fall. I’m glad to enjoy my first experience. My left foot didn’t lift high enough and there must have been uneven bricks which is very common on pavement. There were 6 points of contact left knee, left hand, right hand, right arm, right shoulder then my face on the right hand side. My poor Garmin suffered serious scratches as well. I was going up a mild slope, how lucky I was! I got up and said “no problem I can continue”, my friend said he saw only minor scratch on the face. We continued running for another 2k then walked back. For a short while after I got back on my feet I was wondering where I was running. I saw the bridge (the first picture here), yes I’m running in Castle Peak, where did I park and where did we start running? I was also recalling what did I do yesterday. Maybe at that point in time blood was serving the muscles skipping my brain.